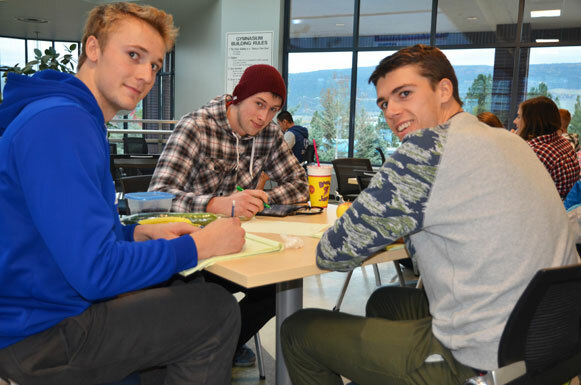 UBC Heat volleyball teammates Jim Bell, Josh Harvey, and Kristof Schlagintweit, far left, pull out the books during a lunch break at the gym. To some, volleyball is a just game. To others, it’s science in action. Whether it’s gravity, velocity, acceleration, or angles, the science behind the widely popular game is clear. Being able to apply that science is another thing. 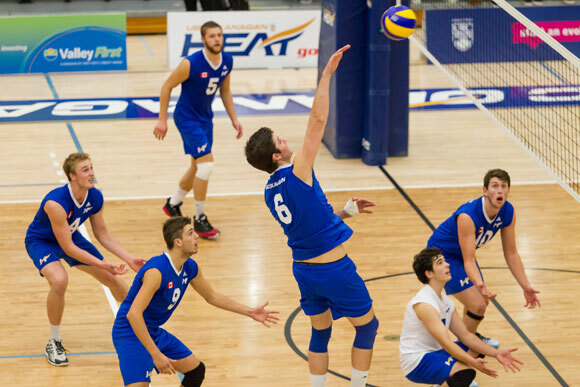 At UBC’s Okanagan campus, the men’s Heat volleyball team is rich with School of Engineering students—a fact not lost on the coach and close-knit team members. Of the six team starters, five are engineering students. Third-year mechanical engineering student Jim Bell is at ease around his teammates, who are also his classmates. When not on the court, training in the gym, or in a lecture hall, they’re together eating lunch and poring over textbooks or quizzing each other on scientific theories and game schedules. Indeed, knowing physics and angles is just as important as being able to set and serve. All of the Heat players grew up playing volleyball and were recruited by Heat scouts. While playing at the elite Canadian Interuniversity Sport (CIS) level, there is also the underlying understanding that grades come first. As university players, the students must take at least 18 credit hours (six half-year courses) each year while they have the opportunity to spread their varsity careers over the five-year CIS eligibly period. That takes some pressure off, but the engineering workload is challenging. Combine classes and lab time with two-hour volleyball practices four days a week, specialty and personal training, along with league competition in a conference that spans from BC to Manitoba, and there are few hours left in the week to crack open those books and memorize scientific theories. Third-year engineering student and team setter Kristof Schlagintweit says time management skills are essential. Especially knowing that every second week—due to travel schedules and away games—they miss a Thursday afternoon and all day Friday. It’s not uncommon for Heat student athletes to study on planes, have quizzes invigilated by the coaches in hotel rooms, or leave the court if an exam has to be written at the same time as practice or a competition. Flexibility in the classroom is also essential. Senior mechanical engineering instructor Ray Taheri fully supports his students who play varsity athletics. With several first- and third-year student athletes in his classes, he does his best to accommodate their playing schedules. Success can come in many forms. For Josh Harvey, the 6’6” team middle, while winning is the absolute goal, team friendships are a happy by-product. This Heat team is still young, with most senior players in their third year, and not a lot of wins on the court yet. But the team has bonded; almost every waking moment is spent together. Not only do they play, train, and study as a team, they grocery shop together because as Harvey says, they have to eat well (and they eat a lot! )—which is all part of science in action. Jim Bell, left, Kristof Schlagintweit (No. 6) and Josh Harvey (No. 10) work with their teammates during a recent game at UBC Okanagan. Courtesy Greystoke Photography.